I have known Bente for over 20 years during her long term as Director of Alberta’s University Teaching Services (UTS). We have worked together on many different initiatives, including an ambitious plan to reform teaching and learning at Alberta in 1988 (the Inventory and Plan for Teaching Effectiveness), and more recently the very successful annual orientation for new faculty. Many of you will know UTS for its unrivalled and extensive workshop program and its widely circulated, most beautifully illustrated educational development newsletter, reflecting Bente’s extensive contacts in the Alberta artistic community. UTS was one of the earliest and best-known educational development centres in Canada, and the first to host an STLHE conference outside Ontario, in 1989. 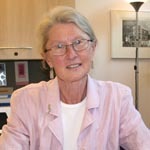 Bente served on the Steering Committee of STLHE for many years, and has served on almost all its other committees. Apart from her work as an educational developer, Bente has many other talents, for example she is a professional gallery curator, published writer on art (especially print-making), gardener, cook and — despite her slight figure — general gourmand who knows the best restaurants in every STLHE conference venue. In 2002 she was honoured by the Academic Women’s Association of Alberta as their « Woman of the Year », and there is a graduate scholarship in her name. Despite all these accomplishments, perhaps Bente’s greatest attribute is not to push herself forward, but rather to marshal the efforts and resources of others, indeed, to let others shine, something she does with a mixture of modesty and tenacity. Her nominators describe her as a welcoming presence, mentor, role model, and general inspiration and support — they say especially for women, but I can attest also for the men who are lucky enough to come within her orbit. For all these reasons it gives me great pleasure to present the third Christopher Knapper Lifetime Achievement Award to Bente Roed. Bente will make a special presentation at next year’s annual conference.